Future changes in climate will vary regionally depending on the response of natural climate systems to increasing greenhouse gases. A collaborative team from UNH, UMaine and Dartmouth recovered two - 208 m surface to bedrock cores from the Mt. Hunter Plateau in Denali National Park. Detailed analysis of the multi-variate glaciochemical records and melt layers in the ice cores indicate that snow accumulation has more than doubled over the industrial age and summer are significantly warmer. These results will be discussed in the context of changes in the Aleutian Low and tropical Pacific Ocean. 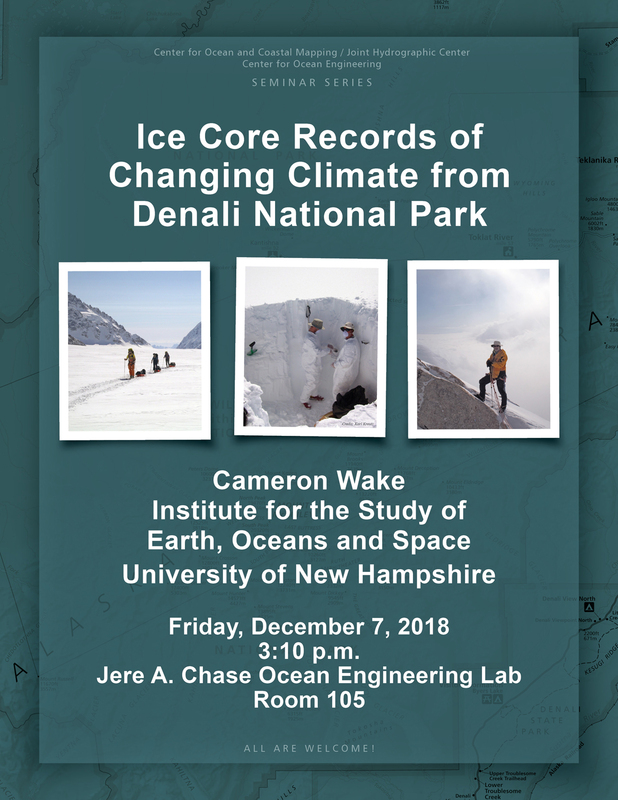 Cameron Wake is a Research Professor at the Institute for the Study of Earth, Oceans and Space at the University of New Hampshire and is the Josephine A. Lamprey Professor in Climate and Sustainability at the UNH Sustainability Institute. Cameron leads a research program investigating regional climate change through the analysis of ice cores records and and instrumental data. In addition to teaching classes on global environmental change, he serves as the program chair for UNH’s Sustainability Dual Major. Cameron also helps lead Climate Solutions New England, a collaborative effort to secure healthy, prosperous, and sustainable communities through the pursuit of integrated solutions that include building energy self-reliance and weather resilience. He is an author on over 85 papers published in the peer-reviewed scientific literature and dozens of reports, and has provided hundreds of interviews for state, regional and national media. His collaborative research on several regional climate assessments in the northeast United States has been shared with municipal, state, and federal agencies and representatives, has been covered widely in the media, and has been cited by several as motivation for policy action. In recognition of his engaged scholarship around the issue of climate change, Cameron was awarded the UNH Faculty Award of Excellence in Public Service in 2010.